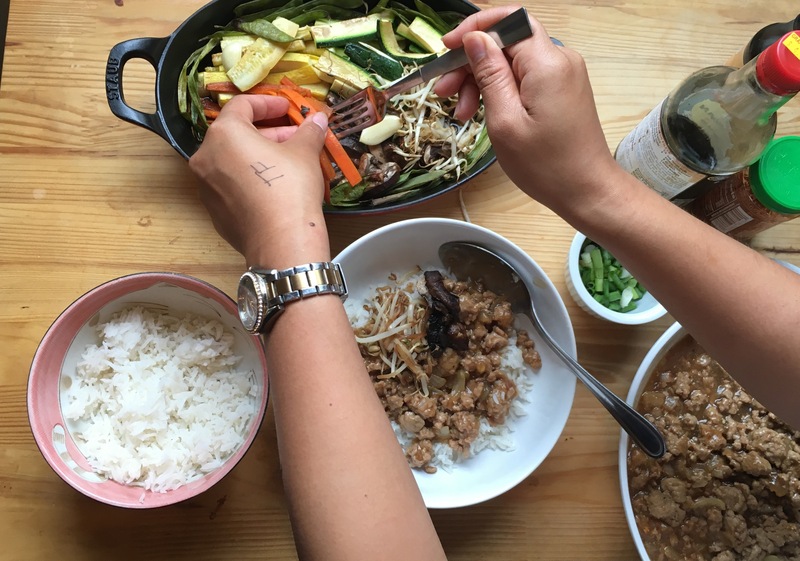 Have you had this happy Korean bowl of rice, vegetables, and meat before? Maybe you think it sounds more like the name of a long, lost Teletubbie sibling? What it actually means in Korean is “mixed rice with meat and assorted vegetables“. I first had this dish when I was in high school. I remember ordering it at a Korean restaurant because it was the only thing I had previously heard of. It also had the added plus of not intimidating me with 17 syllables in the name. 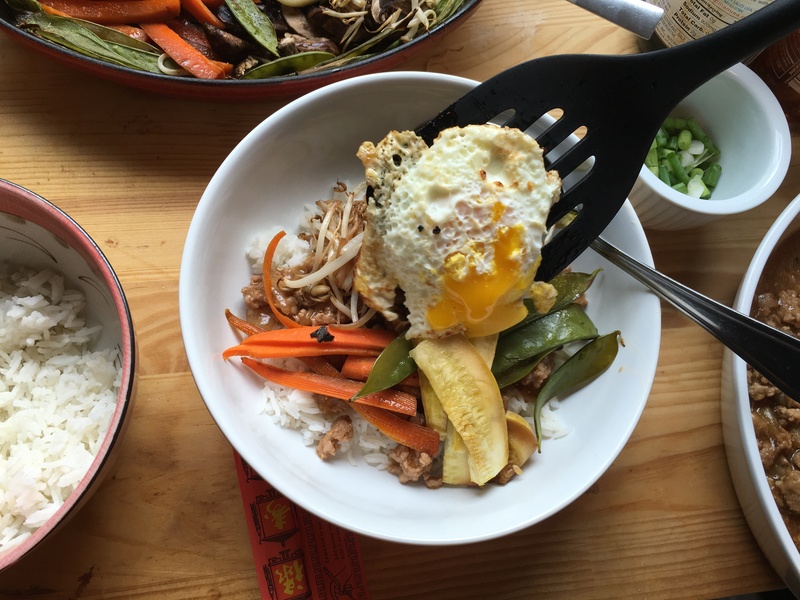 The bibimbap came in a large, sizzling stone bowl with a golden, sunny side-up egg on top. I remember topping it with loads of chili sauce and devouring it without taking more than two breaths. Now Korean food is something I crave regularly and have tried my hand at quite a few dishes at home. The thing I’ve noticed about Korean food is that quite a lot of it can be time-consuming. There are many dishes that require a bit of patience and a bit of labor. Conversely, the cuisine has a few foods that take no time at all. 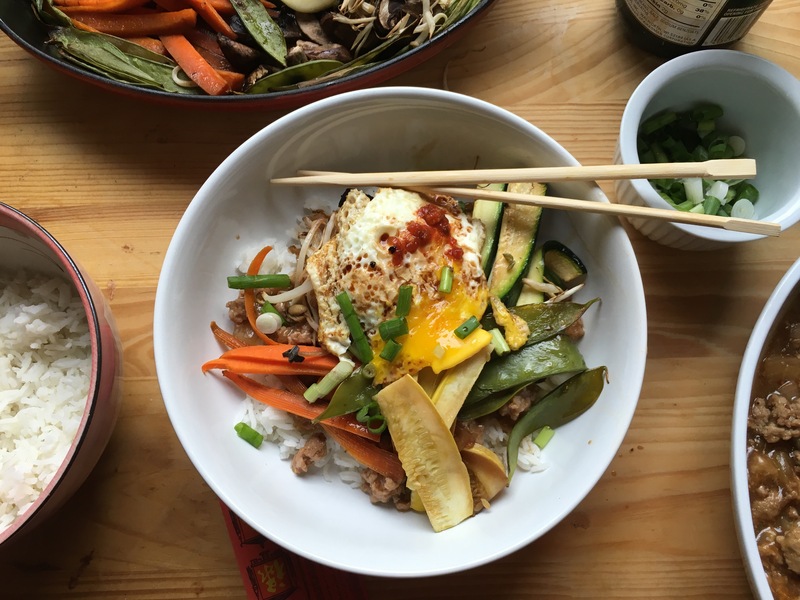 Bibimbap is one of those Korean dishes that looks relatively simple – and it is, but it takes a bit of labor. Traditionally, you ought to cook each vegetable separately and they have different dressings. Then there is your meat and rice. 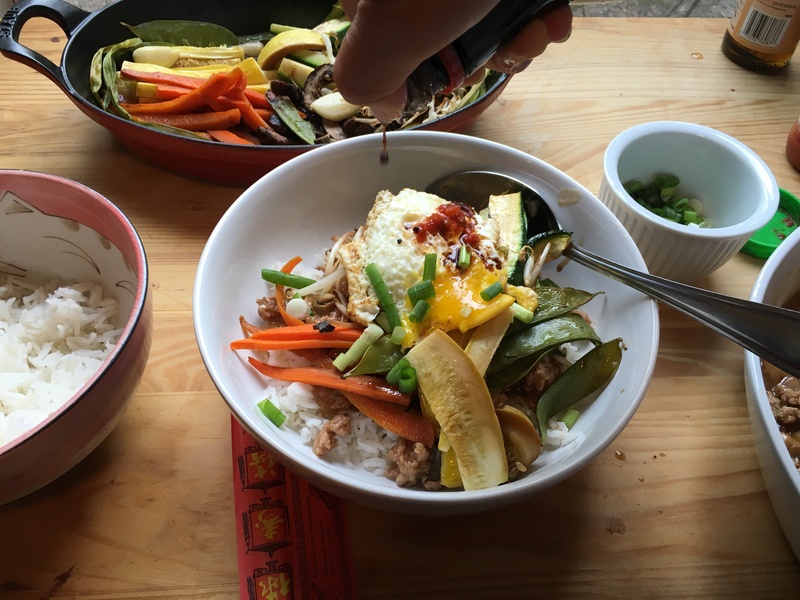 I decided that if we take a few short cuts here and there, we can still come up with something resembling Bibimbap in less time but just as tasty! Caution: Korean cuisine traditionalists may have to avert their eyes to avoid wailing in shame. But, hey – I’m a working girl who is always hungry. Any bibimbap is good bibimbap to me! Plus. Who doesn’t like a bowlful of happiness? *Note: You really could use any vegetables you want. I just used these because I had half of them in my fridge and the other half were cheap and available. I also like the textures of the squash and zucchini and the mushrooms in the dish. 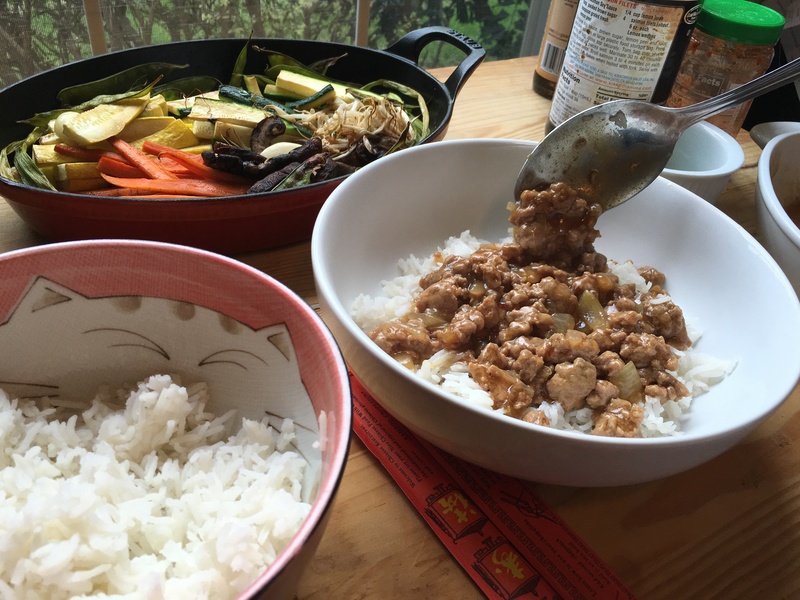 While the vegetables are cooking, prepare your meat: First, get a small bowl and combine the chicken stock, soy sauce, sesame oil, garlic powder, chili, black pepper, and honey together and set that aside. Put a medium skillet on the stove and turn it to medium heat. Saute the diced onions until translucent and then put in your ground turkey. Brown the turkey and break up the meat while it cooks. Once the turkey has almost finished cooking (1-2 minutes), pour in your chicken stock and soy sauce mixture. Bring the mixture to a medium boil. In a small bowl, mix your cold water and corn starch together and then pour into your bubbling turkey mixture. Let the mixture continue to bubble until the sauce thickens. Once it is to the consistency of Thanksgiving gravy, the turkey is ready. Transfer to a bowl and set aside. Wipe down the same pan, fry your eggs if you decide to do so. But honestly, why wouldn’t you? 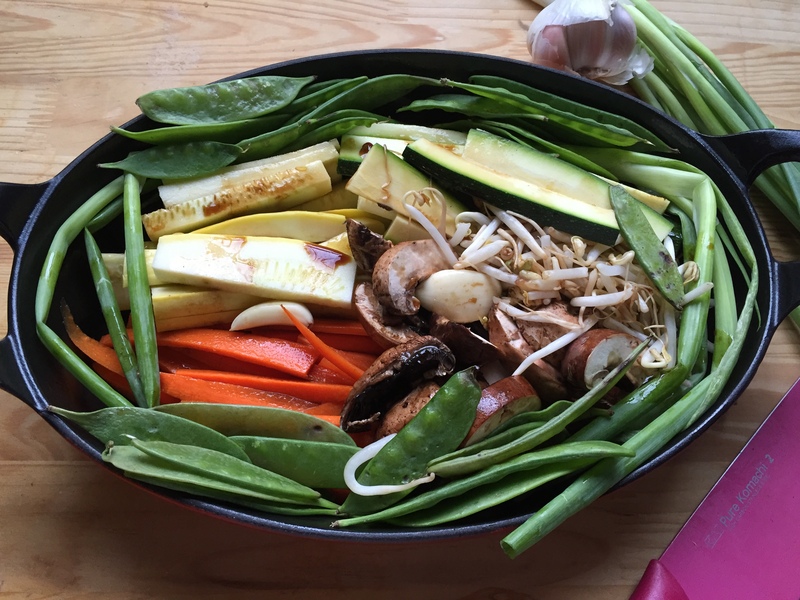 Once the vegetables are ready, you are ready to assemble your bowl. Layer the rice first, then the saucy meat, and the vegetables next. 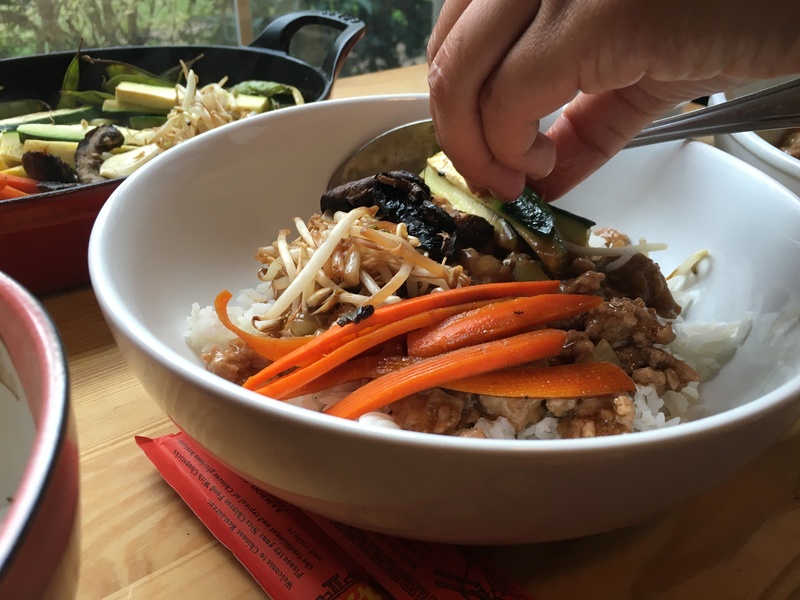 You can arrange the vegetables in the traditional Bibimbap style where they are lumped together by the kind of vegetable. Then place your glorious, runny egg on top and garnish with an obscene amount of chili sauce and scallions and a little more soy sauce and sesame oil. Please excuse my written reminders on my hand. I’m terribly forgetful and must have things practically tattooed on so that I can remember them. However, rest assured, I never forget to eat. Destroy your pretty vegetable placement and mix it all together like a savage. Devour it all on the floor of your kitchen while your dogs stare at you jealously. Or eat at a table like a civilized person. Whatever floats your boat, really. Most of the lovely photos were taken by Nick W.